Pieter Engels was born in 1938 in Rosmalen at 's-Hertogenbosch. By the year 1962 he created mostly monochrome paintings. Later he began objects, also to create the most colored. He calls himself not artists but "recreator-animator". His art is a provocation and parody of the established art world, which he rejects as a consumer world. In 1964 he founded the 'Angel Products Organization' (EPO), which held annual product fairs, where, for example, he presented senseless, not usable furniture. 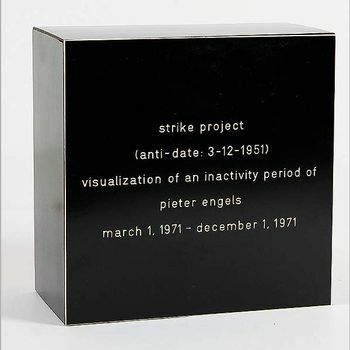 In 1967 he invented ENIO (Engels New Interment Organization; "Angel New Burial Organization") as a concept name for numerous objects and actions. Wood, signed, 20 x 20 x 10 cm.